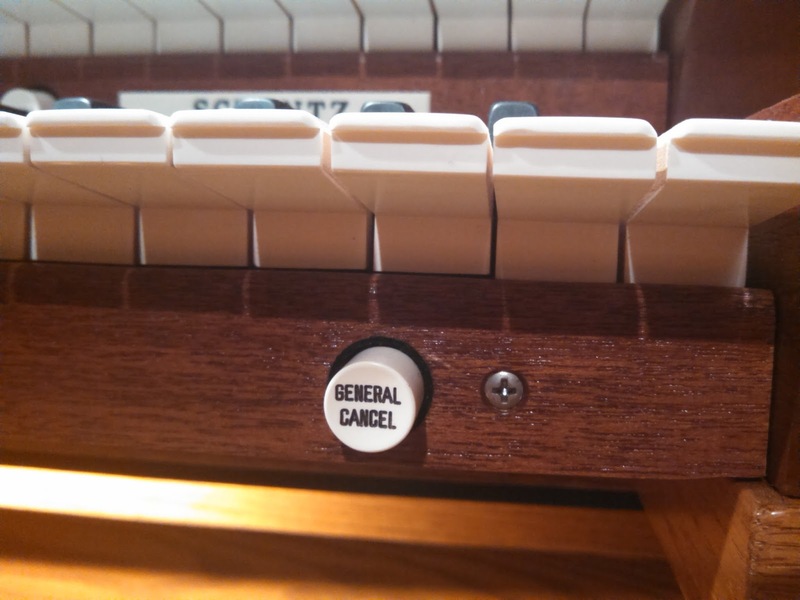 It's perfectly natural for a pianist asked to play the organ in church to be afraid of the instrument. I remember the look on the face of a piano student of mine when she first sat on the organ bench (at my prodding). A year later she was subbing for me in church, looking confident and in command. At first, however, when presented with such a plethora of knobs and buttons it is no wonder she was worried. 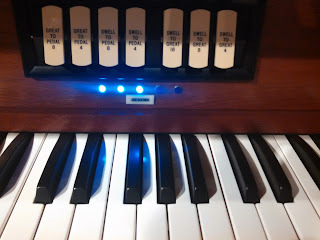 A couple of weeks ago I presented a real life example of an adventure I had with organ registration that I hope showed what an amazing and flexible instrument an organ is and what a wide range of sonic possibilities it has. That is all well and good, but of course if you are new to the organ the first thing you are worried about is not whether or not you are going to sound creative and interesting at the organ bench but whether you are going to do something really stupid and make a horrible sound that the whole congregation will hear! Give it a push. If it causes a lot of stop knobs to dive back into their rest positions, and makes a loud noise, than it is a good thing we did it. Besides, it is a short bit of racket, and even on Sunday morning people won't be that perturbed if you do it once in a while. Good! Now, when you depress keys or pedal notes you should get no sound at all. If you are still getting sound, call our tech support hotline at---just kidding, we don't have a tech support hotline. Although you could send a picture of the console and I could try to figure it out. Now I'm going to introduce you to just two types of organ sound. The first are the flute stops. They are easy to find because they all have names with the word flute (or the german flote) in them. like spitzflote, rohrflote, chimney flute (which is the same thing as a rohr flote) or koppelflote (my favorite). The nice thing about these is that they aren't very loud and they have a pleasing sound. Your organ may have several. Play a piece of music using just one of them. Perhaps a verse of a hymn or a short section of something you are working on. Then push that one back in and try another. The idea is to try them one at a time and notice the subtle differences between them. Then try them together. There are two on each of the two keyboards on the organ at Faith. One of the them is called a Bourdon, which does not have the word flute in it anywhere, and is currently the only exception I can think of to what I just said. It means "covered" because the pipes are capped at the top and it makes a dark, mellow flute sound. Flute stops will have whole numbers beneath their names like 8 and 4. Eight is your basic pitch--play a middle C, get a middle C. Four will give you an octave higher. If you put them together you have a nice blend. If you use a 4 by itself it may start to sound like a choir of chipmunks, but pleasant nonetheless. The only problem with flute stops is that they are not likely to be loud enough for congregational singing. So if you have hymns to play you need to acquaint yourself with the foundation stops. These sound a lot like the flute stops but they are usually quite a bit louder. Foundation stops form the basic, fundamental sound of the organ. They are also marked with whole numbers like 8 and 4 and in most organs they are known as principles. Your organ probably has a stop marked principle 8. Try it out. It is likely to pair well with an "octave 4" with is also a foundation stop. This would be a good way to start with hymn accompanying. It will be a bit bland, but it will be safe. Do me a favor, though. Don't just pick one group of stops and leave that on the entire service. If this is your first week and you are trying to get through an entire church service, I understand that you aren't very comfortable with a lob of knobs. But at least do this: for preludes, offertories, and anything the congregation is not singing, use some combination of flute stops. When the congregation is singing, use the principle stops. That means you will have to pull out (to turn on) or push in (to turn off) a couple of stops before each piece you play. I want you to get used to doing that--be aware of those stop combinations--don't just set them to something safe and leave them that way forever. Besides, as long as you are using stops with 8s and 4s on them, you won't be able to make any really unpleasant sound anyway. The principal also might be called an "Open Diapason", in which case the principal would be at 4' pitch. And on German organs it will be a Gedeckt, Gedackt or Lieblich Gedeckt rather than a Bourdon.